The first impression of your Big Fat Indian Wedding is made with the invitation cards. And you know what they say – Your first impression, is the last impression. Do not miss out on making the first impression of your wedding count. Mummyji’s, Auntyji’s and lots of Maasis cherish wedding invitation cards for eons to come – so why not give them more reason to do so? 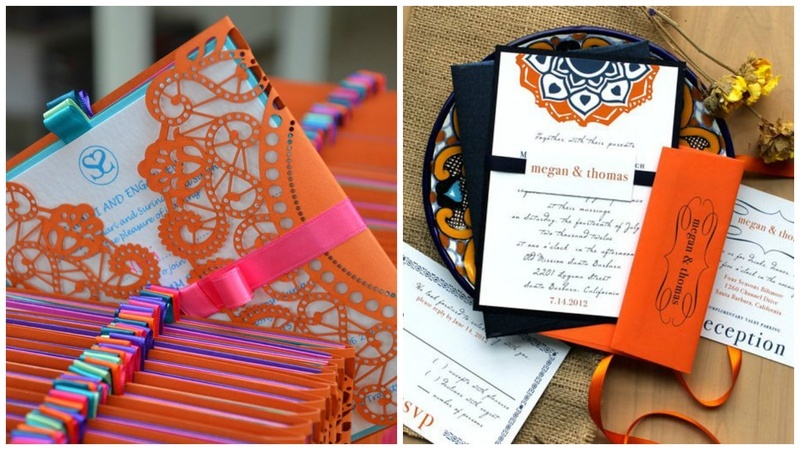 We show you how the LITTLE details on your indian wedding invitation cards can make a BIG impact. Whatever kind your wedding invite might be – laser cut, envelope, pop-up card or just a simple folding card – add these details to make even the simplest wedding cards stand out in everyone’s memory. Addition of latkans or tassels even the simplest wedding card designs can make them look like royalty. They not only make your invites look regal but also successfully bring in that perfect touch of desi. Keep your invitations extravagant and colourful while adding these accessories to bring a complete look. Metallic wedding cards are like the dhoop-chhaon sarees of the wedding invite category. For real! They bring in a chic-modern effect to the classic, traditional wedding cards. If you’re not a fan of the silver or gold metallic on the text of your wedding card, then opt for hues that are now trending like – rose gold or steel grey. ‘A little shimmer never hurt nobody’ is the motto we live by, so why not incorporate a little of this glittery goodness in your wedding card too? If you’re not a fan of the bold sparkly crystals, you can always opt for dull gold and dull silver cards like these. Taking your wedding game up multiple levels with the clean classy look they bring – these dull shimmer cards are a good option. You don’t always need to go all-out shimmer, minimal sparkles and crystal bands make a statement just as stunning. If you’re the old-world kinda bride who wants a wedding that is minimal and rustic, yet classy – keep it tasteful with these block printed wedding cards that know how to make a statement and speak perfectly of your personality. Match them up with these seals embedded with family initials or a minimal icon that represents your love story. A mini element like this one has the ability to glam up your wedding invites, bridal shower invites or even your wedding order of service. It brings in volume and adds an element of grace to your wedding. Pick bold colours with subtle shades like contrasting fuchsia pinks with off-white and marsala with navy. Use a palette of elegant colour combinations. The quirk-kitchy factor does not work too well with ribbons, hence going the elegant, classy way will surely do you good.